Poll results reveal a caravan cover up! Many caravanners are a protective bunch who like to cover up their ‘van, on and off the road. Well, that was what we can reveal in our latest caravan and motorhome cover poll results. Last month we brought you a gear guide on towing covers and asked if you use a cover on your ‘van. 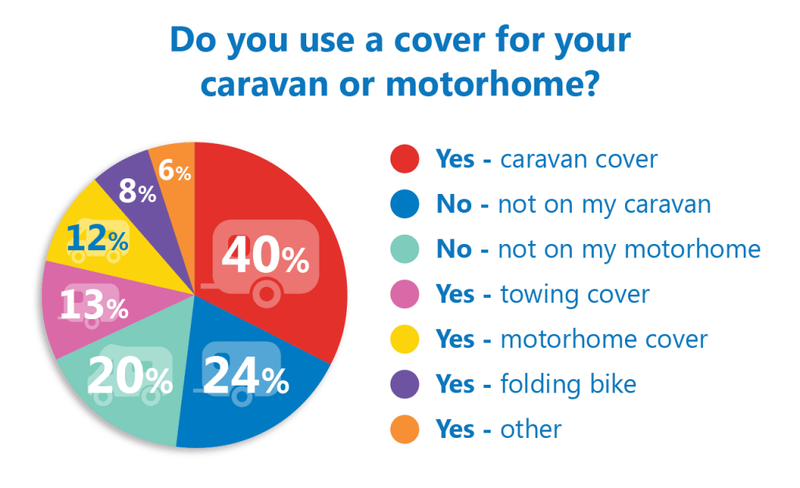 With nearly 500 votes, 53% of caravanners use some kind of cover – 40% use a caravan cover off the road and 13% use a towing cover. Not as many motorhomers took part in the poll and the votes showed that not as many choose to cover up their pride and joy – with just 12% telling us they use a protective cover. A lot will depend where you store your ‘van, with a cover clearly not essential if it’s already protected from the elements by being stored inside or under a canopy. And thanks to those who shared the pros and cons of a motorhome or caravan cover. A good tip seems to be to invest in a good quality one with breathable fabric. David L says his caravan cover keeps the ‘van immaculate when used. “You do have to prepare the van well, covering all sharp projections or they will cause wear marks on the cover, and even small holes,” he advised. “I also covered the windows with the soft material provided with the cover. It’s a two person job to fit the cover, and I would recommend buying a good quality one from a reputable manufacturer, making sure it is of the breathable type. Here’s what Martin Staines had to say after putting his Protec motorhome cover on in October last year and taking it off in April. You may remember a few years back we heard from a customer who told us his Protec cover saved his caravan from a potential insurance claim when a tree fell on his Bailey. How much does a caravan cover cost for a 2nerth 2007 model swift van . I think I may have bought a cover from a the same supermarket as Ray Jones. Although not exactly the right size it has done its job over the winter and has proved to be a bargain. Incidentally I manage to fit the cover without help – just need a bit of forward planning and a calm sort of day! I regret that I did not respond to your survey. Perhaps the following will be of interest to many motorhome owners like myself who do not use their vehicles outside of the April to September season. I started using a cover for my Swift Modial (based on the Peugeot Boxer panelvan) motorhome because it is stored outdoors in my drive between September and April. There are oak and sycamore trees in the neighbourhood and cleaning the debris that accumulated over the winter months -on the roof and solar panels, around the skylights and at the bottom of the windscreen (which blocked the drainage tubes beneath the wipers)- was time consuming. In the absence of a car port or garage of sufficient height I thoroughly recommend the use of a cover for storage. Not only does it protect the exterior finish of the vehicle but also reduces the bleaching effect of the Sun on interior surfaces. It was interesting that 2 years ago, when I attempted to place an order by telephone with a recognized manufacturer, whose advert I had seen in a Motorhome magazine, that I was spoken to dismissively when I described the salient roof fitments: solar panels, reversing camera and tv antenna! In fact the lady with whom I was speaking ended the conversation by hanging up on me! So much for customer service! I had given up on the notion of getting a cover when last summer whilst on vacation in North Wales I came across by chance a caravan cover in a supermarket for just 50 pounds!. I checked the dimensions and purchased it there and then. It fitted almost perfectly! I made covers out of plastic containers for the reversing camera and the tv antenna, which I affix before covering the van for its winter storage.. I have experienced no problems. Even during gales, the strapping provided with the cover kept it in place and there has been no scuffing of the van’s paintwork or damage to the cover!! My next cover (for my next Motorhome?) will be custom-made, but not by a certain recognized manufacturer that’s for sure!! I used a Towing Cover for the first time last week and I am delighted with the result. We arrived at our destination with a clean caravan front no marks from road film or dead flies. well pleased thank you Towsure. Thanks for letting us all know Adrian. This result does not tally with my observations of outdoor caravan storage parks and those outside residences which indicate only a small minority use covers. Maybe that the majority of the people that bothered to respond to the poll were the ones that use covers. Sorry to hear you’ve had a problem with your covers Sandra. To prevent mould it’s important to keep the cover clean. With regards to your towing cover then the cover should fit the width of your caravan, so not sure what the problem is there. We’ve been in touch with Protec with your concerns and they asked you to contact them on 01274 780088 or info@proteccovers.com so they can help resolve the issue.